KEIZER — During the 2017 season, the Horizon Christian High School baseball team was at bit of a disadvantage. The Hawks had no seniors. That means, of course, that there was no senior leadership and definitely no seniors to turn to. With a strong group of four seniors helping lead the way, the Hawks took off. "They were huge this year," Horizon Christian junior Luke Klein said of the seniors on Friday, after the Hawks fell 10-5 to La Pine in the Class 3A state championship game, held at Volcanoes Stadium. "Last year, we didn't have any, they were all juniors. They came out this year, and they were a huge help to us." That group of seniors — Matt Brennan, Brannon Macfarlane, Nathan Brucker and Nathan Murrell — helped guide the Hawks to a final record of 20-8, in addition to the team's third Class 3A state championship appearance, and the first since 2013. "We've been playing together since freshman year," Murrell said following Friday's title tilt. "We've bonded so much and brought this program to where it is now." 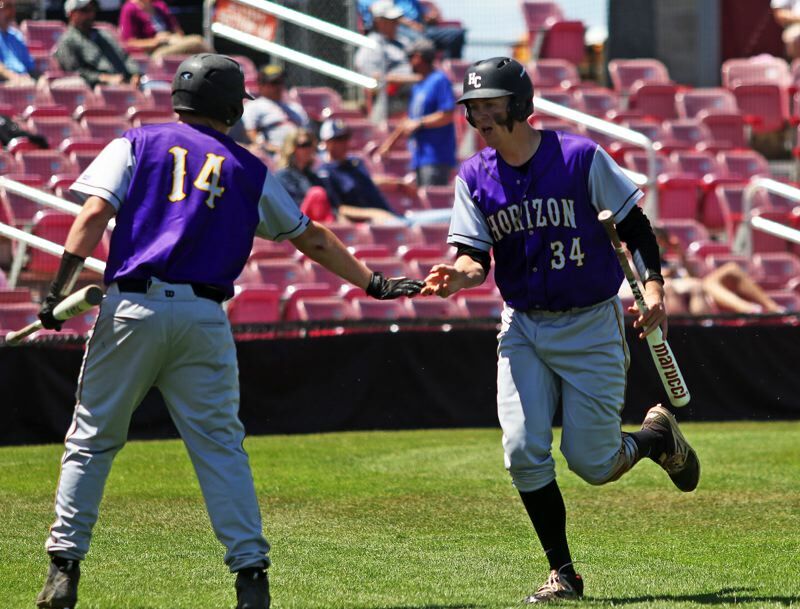 In addition to providing leadership, the Horizon seniors stepped up on the field, especially in the state playoffs. In a 13-12, come-from-behind quarterfinal win on the road against Stanfield/Echo on May 25, Macfarlane went 3 for 3 at the plate with three walks, two runs scored and two RBIs. Brucker went 2 for 4 with a pair of runs scored and Murrell drove in three runs. Then, in the 5-1 semifinal victory at Santiam Christian on May 29, Macfarlane drove in a run and scored a run. Murrell also scored a run. In Friday's championship contest, Macfarlane had a hit and drove in a run, Brucker also plated a run and Murrell had a hit and scored twice. The seniors also shined during the regular season. Brucker, in fact, pitched back-to-back no-hitters in West Valley League victories over Amity and Sheridan. For Murrell, it was a senior season that not only saw him help the Hawks reach the Class 3A baseball state championship game, but also shine for the Horizon Christian football and boys basketball squads. "It started out with football, eight-man football, I played at quarterback, and that was a lot of fun," Murrell said. "It went straight to basketball, not much of a break. We went to the state tournament, and that was a lot of fun. It was a great group of guys. And then, this team was just a continuation of last year, when we had no seniors. It was a great group of guys, who all love the Lord, and love playing baseball." And, despite the loss of this year's seniors, Murrell sees good things ahead for the Hawks' baseball program. And I have no doubt that they're just going to continue this next year," he said.